Meet the new Potomac Mills Chuck E. Cheese’s! Thanks to Chuck E. Cheese’s for inviting us to the grand re-opening of the Potomac Mills restaurant! If you’re familiar with the legend of the phoenix, you’ve heard the story of how it emerged from the ashes, some say better than before. 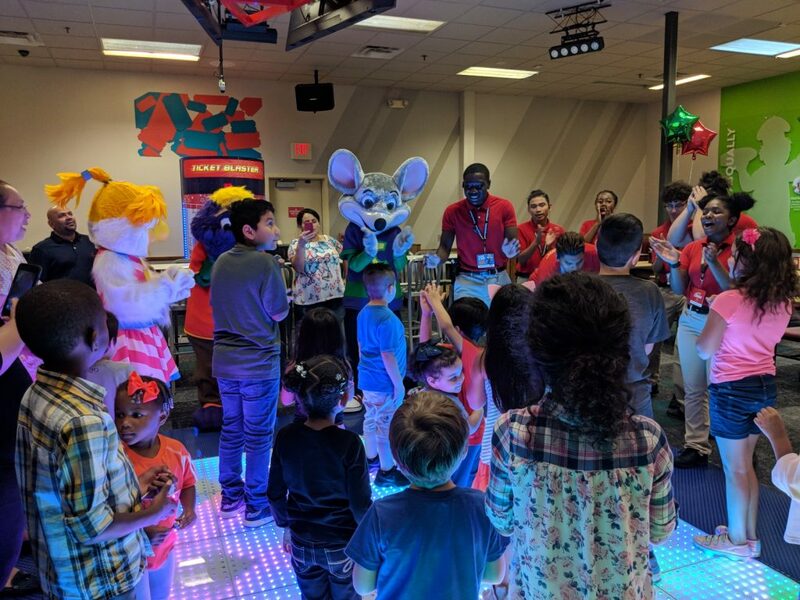 Earlier this year, a fire that started outside the restaurant damaged the Chuck E. Cheese’s location in Potomac Mills, closing it over many months. Now this Chuck E. Cheese’s location is not only open again, but it has reemerged in an even better form. Newly redesigned, the Potomac Mills location is the first one in Northern Virginia to get a new “look” that other Chuck E. Cheese’s restaurants eventually will be getting. The ribbon is cut and the doors are open at the Potomac Mills Chuck E. Cheese’s! The new design aims to have more of a traditional restaurant atmosphere for moms and dad, while still being a fun place for kids. 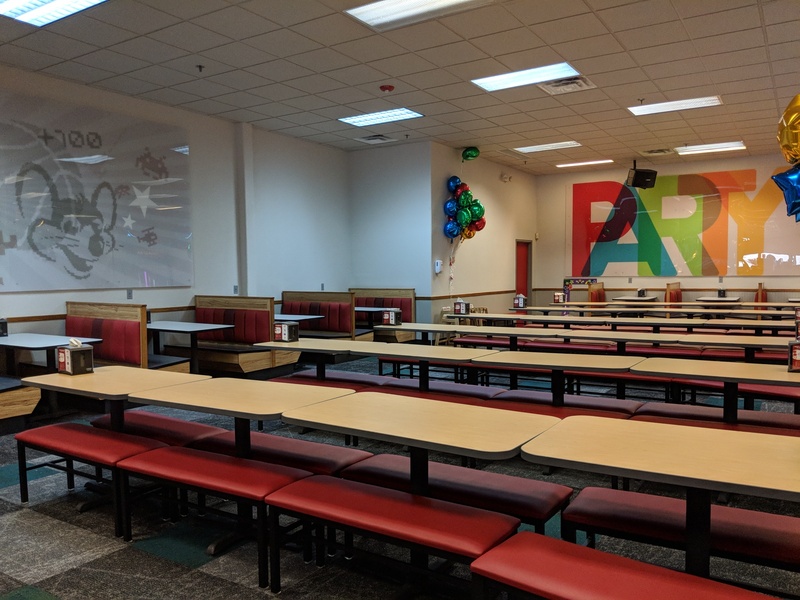 It simplifies the décor while not taking away from the fun and games that has made Chuck E. Cheese’s the place “where a kid can be a kid” for 40 years. See below for more on the redesign, the new look for the kitchen, and the very convenient new options for play. 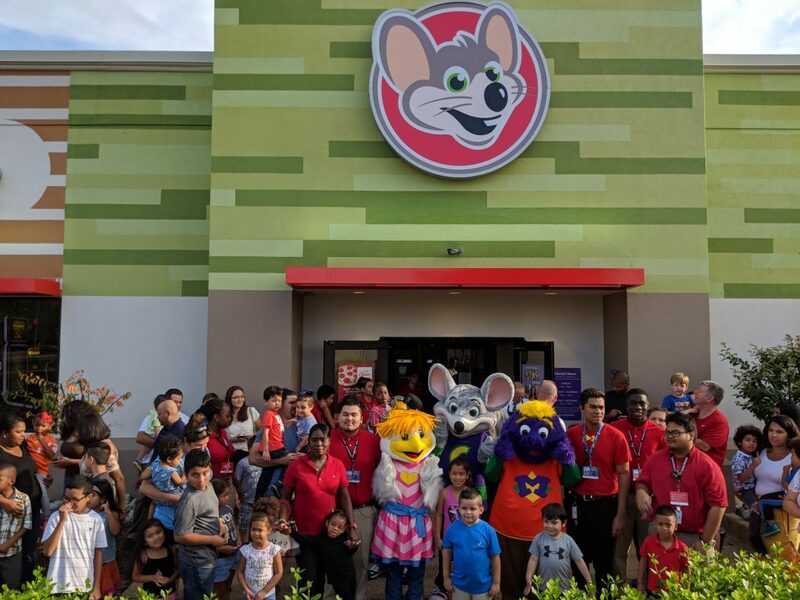 Chuck E. Cheese’s recently partnered with San Francisco-based design firm, Tesser, to update its Potomac Mills flagship restaurant with a focus on fresh food and fun for the whole family. To appeal to parents, the restaurant features a more adult ambiance with warm wood, neutral tones, and streamlined art. Instead of seeing bright colors throughout, the walls have neutral paint tones and simpler and more modern graphics. The idea was to create a calmer, more inviting, and friendly environment. Our impression is that this made the restaurant look bigger and brighter. The new design also takes a practical approach. Since many parents end up taking a break while kids play, most of the booths have outlets with USB ports now so guests can charge their electronics (keeping your phone charged for all those photos!). In addition, the Birthday Zone features varied seating options for larger parties, with party sections designated by characters in Chuck E.’s “band” such as Helen Henny and Mr. Munch. The party area has large graphics for each character, with a biography. Chuck E. Cheese’s restaurants feature made-from-scratch pizzas daily, which remain a kid favorite. Remodeled stores such as the Potomac Mills location now feature open kitchens, which allow guests to watch the pizza-making process! But there’s always been more on the menu, including chicken wings, other appetizers, and a well-stocked salad bar. 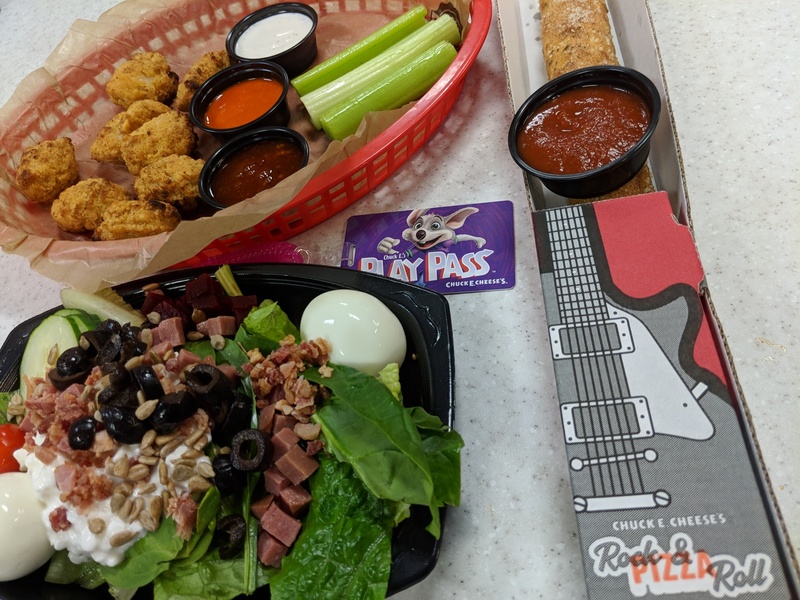 And a new offering is the Rock & Roll Pizza, a long, stuffed breadstick (with cheese or pepperoni) served with marinara on the side. In addition, the lunch buffet, available Monday through Friday from 11 am to 3 pm., is located closer to the open kitchen to tout its fresh ingredients. And while guests still can order from the counter, self-service kiosks are available near the entrance of the restaurants offer a simple and fast option for parents who want to place a quick order. 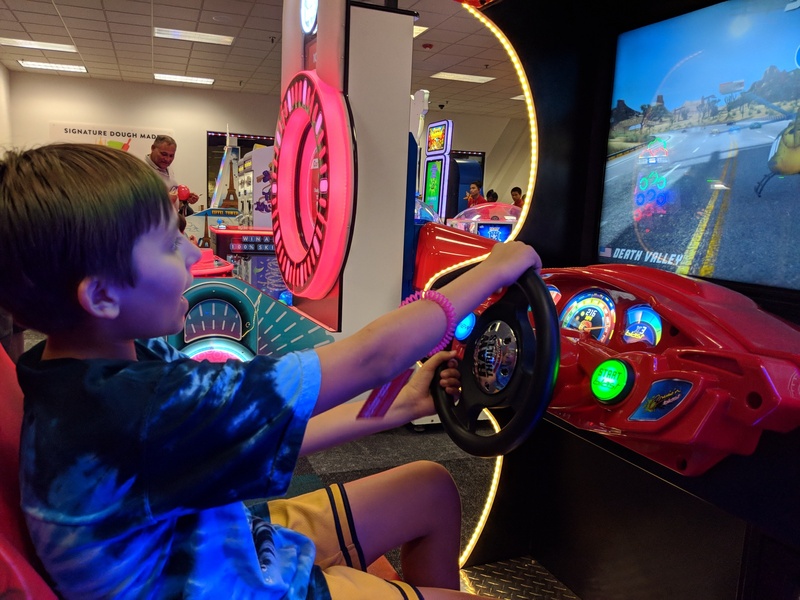 Chuck E. Cheese’s adds games regularly (and rotates some others among its restaurants) to keep a nice blend of favorites with new ones. At least 30 percent of the games in the Potomac Mills restaurant are new. But what may call attention to kids – and some grown-ups! 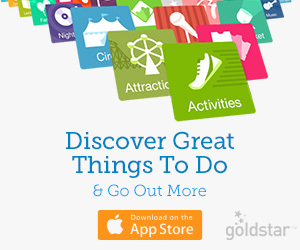 – the most is the all-new light up dance floor where the hourly live show and birthday show will take place. 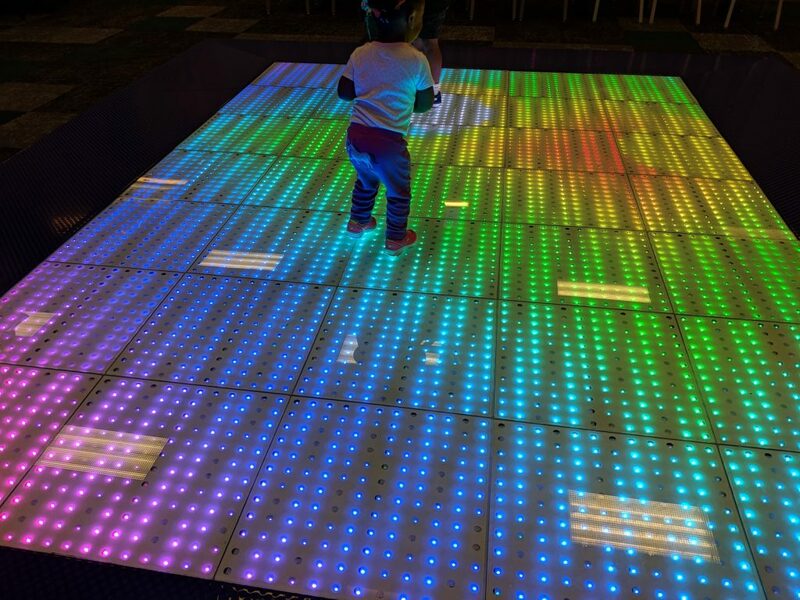 This large, illuminated area was a hit at these little dance parties and “just because” fun moments during the opening day. 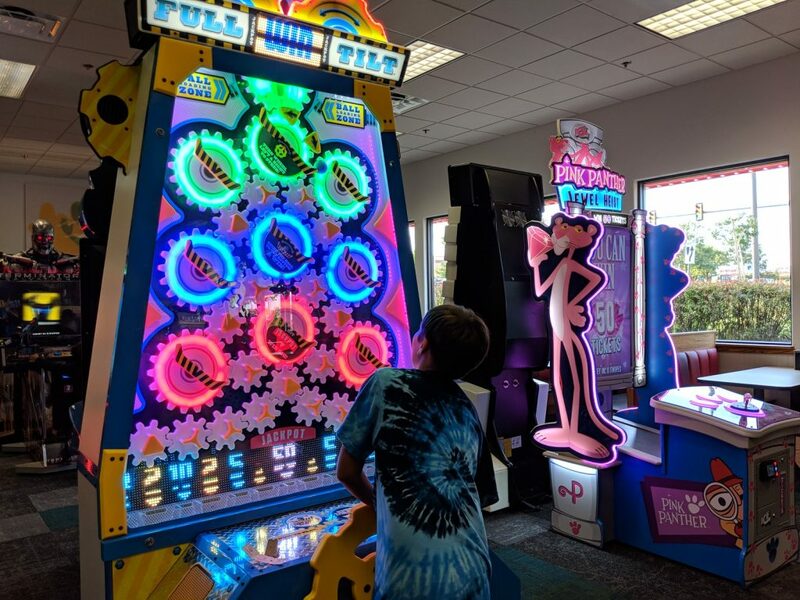 And there’s no need to worry about lost tokens: with Chuck E. Cheese’s new, programmable “tap-to-play” Play Pass game card system, guest no longer have to carry those little cups filled with tokens. Instead, all your credits are loaded onto a plastic card that you tap at each game. The cards are attached to stretchy plastic coil bands so you can wear them on your wrist and not worry about losing them. These bands fit all sizes and we found them to comfortable for adults as well as for kids. One change that will make many parents happy is the “All You Can Play!” option for games. Parents can just choose an amount of playtime, and kids can play as many games as they want, as often as they want, until the time runs out. This takes the guesswork out of the traditional model, when you had to figure out how many tokens kids would use in a certain amount of time. All-you-can-play makes for a great day! 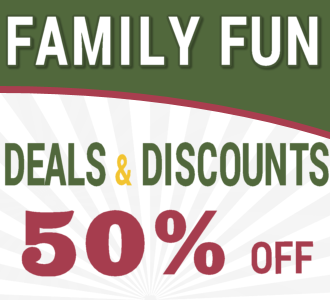 All You Can Play also makes it much easier for parents to schedule their visit – instead of playing until coins run out, families can plan for certain timeframes. This “endless games” option starts at $9 for 30 minutes, and we found it to be a good value. Your kids may want to play longer, of course, especially if they’re Chuck E. Cheese’s “veterans,” as mine is. My 11-year-old played for an hour and never ran out of options. Racing mom never gets old… until mom wins, as I did! A great feature of the timed pass is that you can “freeze” your minutes. Chuck E. Cheese’s thought this one through well, taking into account meal and bathroom breaks. When you need to take a break, you can pause your time up to one time at the kiosk, following simple commands. Then when you’re ready to resume, you just re-activate your card at the kiosk and the clock begins counting again. One thing that Chuck E. Cheese’s is NOT changing for these redesigned restaurants is the tickets. 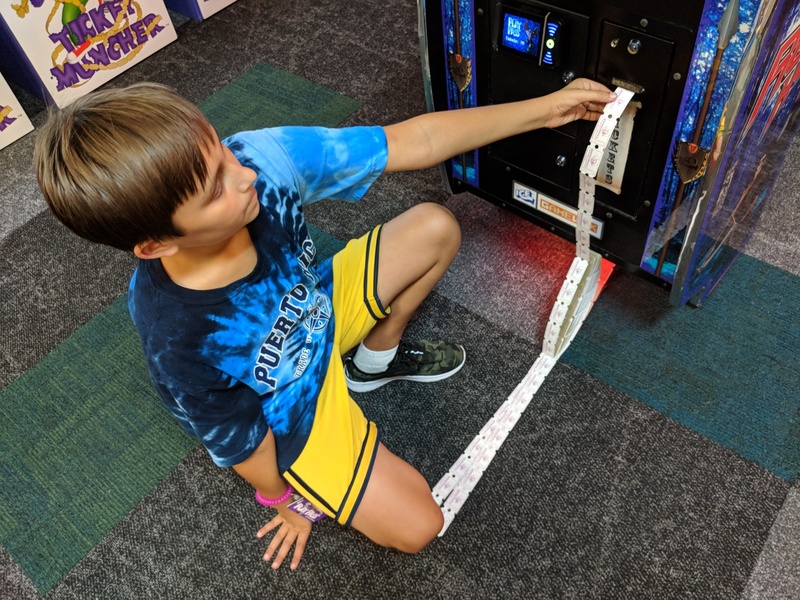 There is something about those tickets – both the dispensing of the winning tickets at some games, and the “feeding” them to the ticket-munching machines – that is hugely appealing to kids. My own son has been going to Chuck E. Cheese’s restaurants for 10 years now and this NEVER gets old. 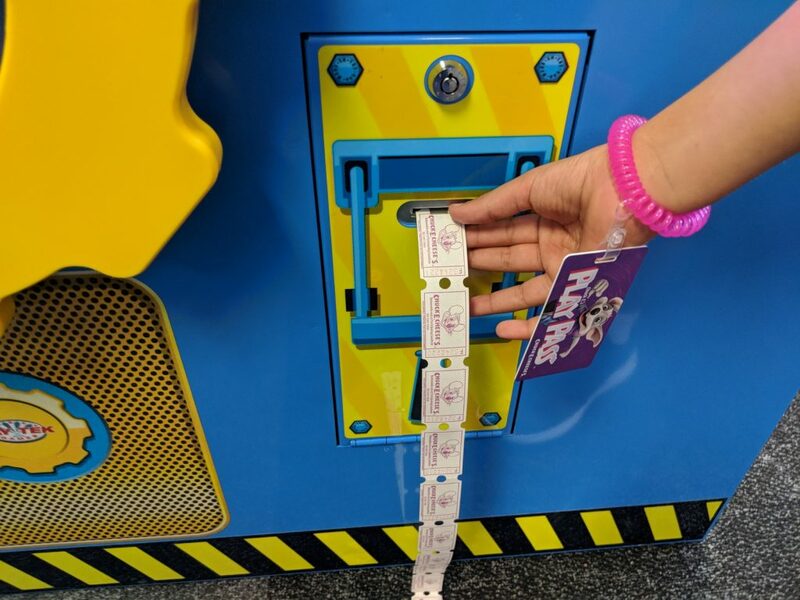 Fans of these paper tickets will be glad to know that not only can you still win tickets – in fact, Chuck E. Cheese’s has DOUBLED the number of tickets you win – but the ticket munchers are alive and well, too, as is the counter where you can redeem them for prizes. It’s always a fun day with Chuck E. Cheese and friends! 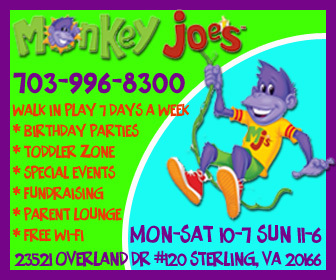 Share the post "Meet the new Potomac Mills Chuck E. Cheese’s!"